One of the biggest complain from users of the old window BBO client is about saving hands. In web, that is NOT impossible, just little different. At the top of your screen, one of the menus is MY BBO. Click on HANDS AND RESULTS. 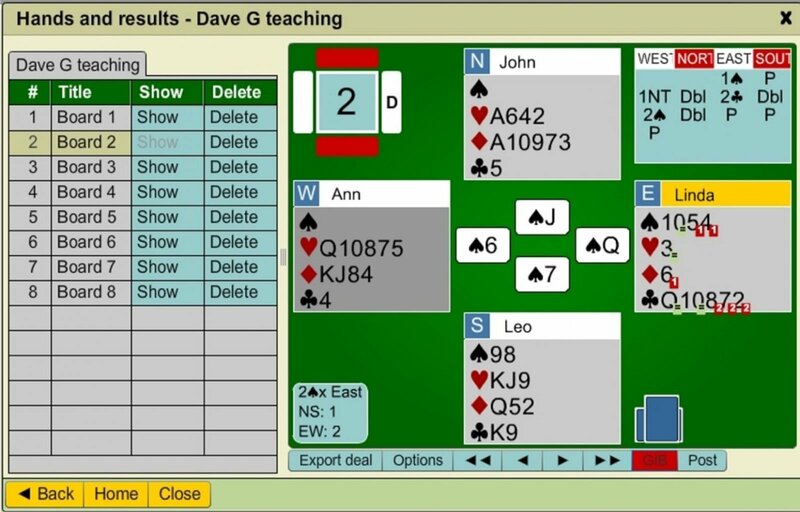 You can re-view any of hands you recently played in tournaments or any room in BBO by clicking one of first 2 buttons (*). Here is how you save hands that you were WATCHING - not playing, or any hands played or watched at the teaching or bidding table. 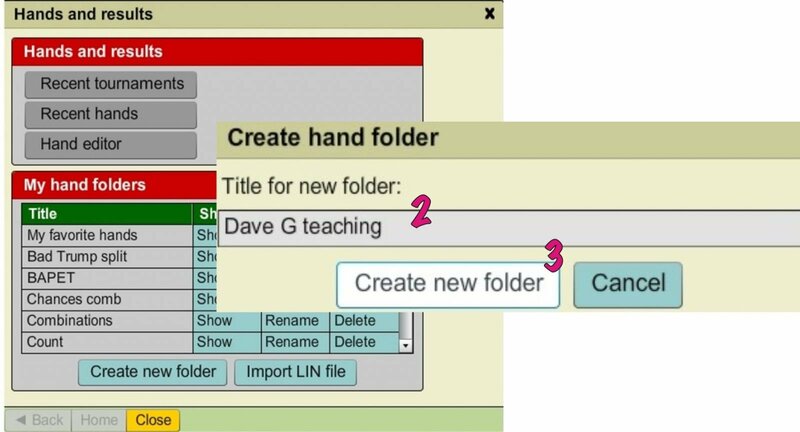 Recommended is you create a new folder, as it will help you find those hands later. 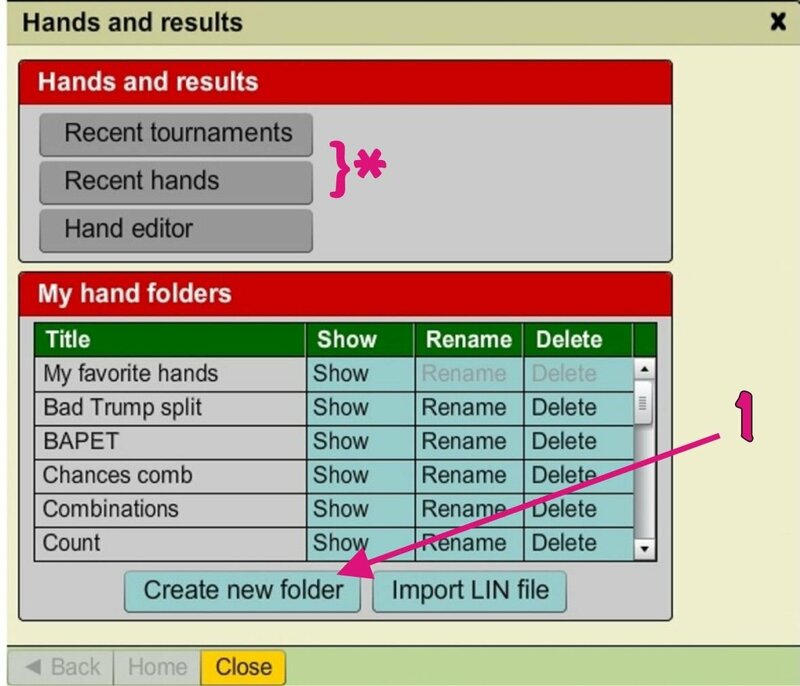 You can skip this step and save them into any folder (for example "My Favorite Hands"), but it&apos;s not easy to move them elsewhere later. and hit "Create New Folder" button (3). Then you can close that window. At any time during the lesson, you can save ALL so far played boards. (and not your friends for example). At the very bottom, there is OPTIONS button (4). You can save All boards listed above by clicking on SAVE ALL DEALS (5). You&apos;ll be asked where to save them. 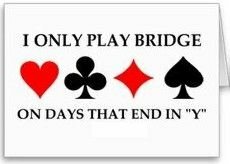 and you&apos;ll get message when it&apos;s concluded (allow some moments if there are many boards). If you do this several times during the lesson, silly BBO will just keep adding new boards to the folder, it won&apos;t "overwrite" ones you already saved, so you will have them duplicated. Yet, that&apos;s a better solution, as if you wait for lesson to end to save all, and you lose connection, they will all be gone!! You only can save boards you kibbed (or played) from the very first bid on to its&apos; very end. If you forgot to save and went to lobby as teaching session ended, you still can save them using same process, until the moment you join any other table, as MY RESULTS will then show hands from that new table. 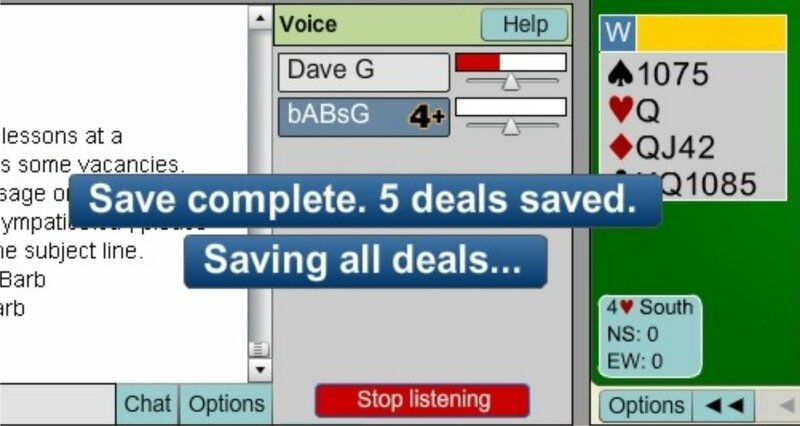 Sometimes, when saving deals from teaching table, you might want to save chat as well (not so often used now, as most teachers use BBO voice or radio). 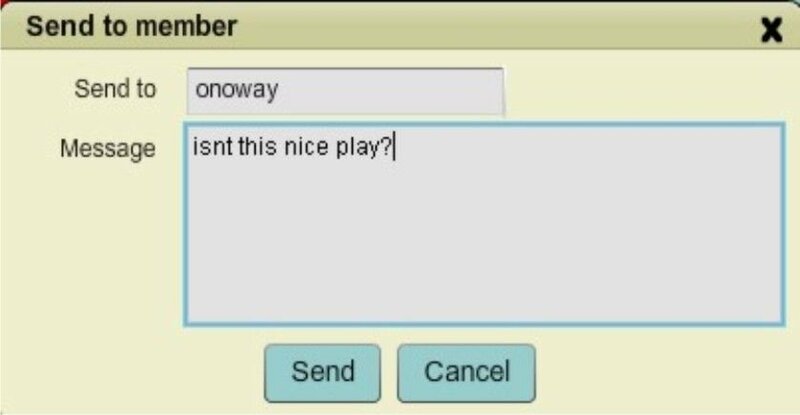 Right click on Chat Area, Select All and Copy (or press CTRL C). Then paste it into notepad or word document and save. At any time you can review hands you previously saved. and click on HANDS AND RESULTS. 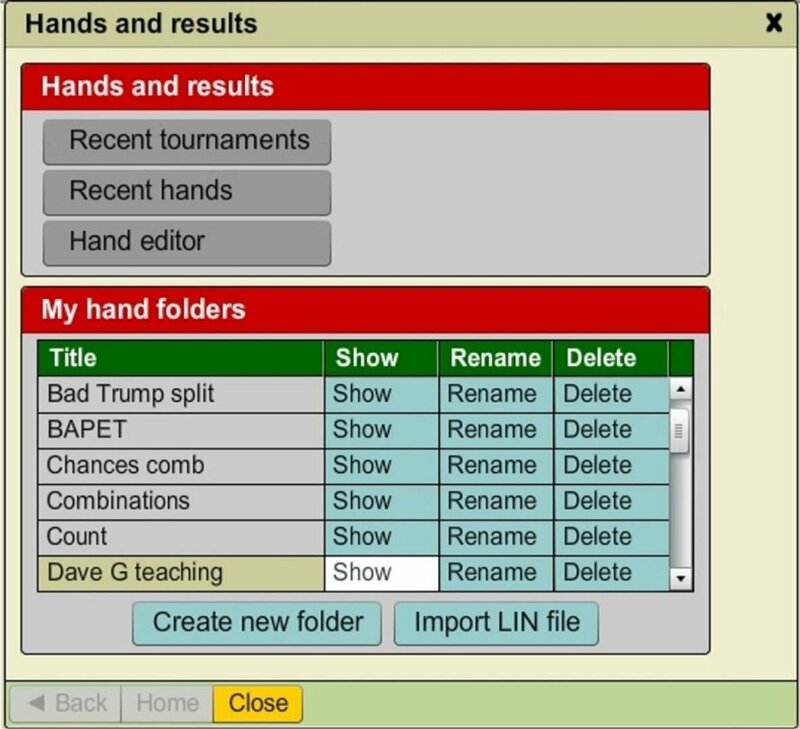 Click on SHOW for the folder where hands are. Now you have all saved boards listed on left side. Click on any of them to show. You can replay them by arrows at the bottom, check what GIB says at any time, use EXPORT to send to a friend, or save it in another folder etc. Button OPTIONS under the results, not only can SAVE ALL DEALS, as it has other useful functions. 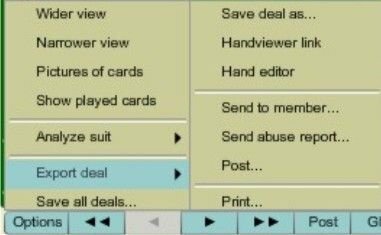 OPTIONS / EXPORT DEAL / HANDVIEWER LINK - gives an outside link to open or send to someone outside of BBO.